PLEASE NOTE: These instructions are for customers of Network Solutions, Inc. We have noticed that several customers of Network Solutions, LLC. have come across these instructions and have not been successful at making these work (because they won’t). If you are a customer of Network Solutions, LLC., you should go to their web site at http://www.networksolutions.com to find the correct instructions. NOTE 2 (December 17, 2014): The screenshots in this post have incorrect information. The text is correct. We are working to change the screenshots shortly. Google is making strides in the smartphone marketplace and the Android based devices are becoming very common. Android-based smartphones and devices include two email clients, one for Gmail and one for other types of email servers including Microsoft Exchange, IMAP and POP3. The following guide will show you how to set up the built-in email application to access an IMAP or POP3 (we support both)email server for incoming email and an SMTP server for outbound email. 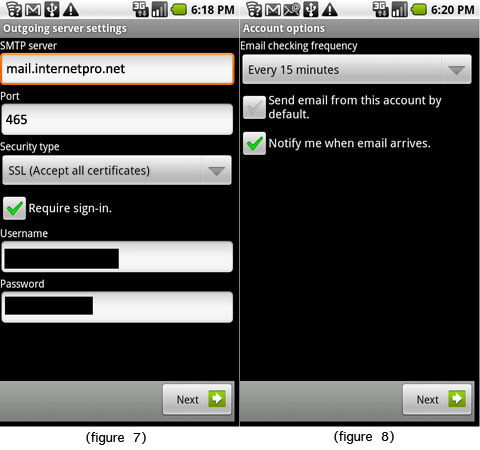 The setup for both IMAP and POP3 is the same so for the purposes of this guide, we will use POP3. See the page on https://www.netsolinc.com/email-settings-2 for the IMAP settings including server names and port numbers. Please note that there are *MANY* different Android devices out now, so your screen may be slightly different. If you are unable to follow this guide and need further assistance, please call our technical support at 256-547-6817 or 877-886-6868. Click on Security type; a new window will pop up and allow you to select the level of encryption (None, SSL or TLS). Email will begin synchronizing once the credentials and server information is entered correctly.